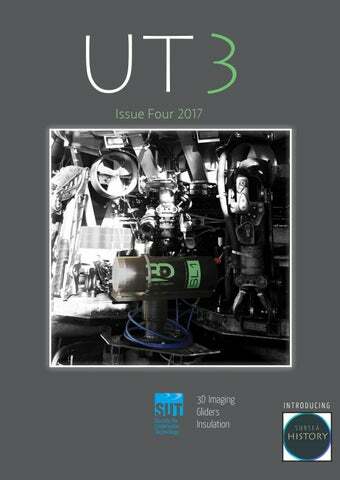 Published by UT2 Publishing for and on behalf of the Society for Underwater Technology. Reproduction of UT2 in whole or in part, without permission, is prohibited. The publisher and the SUT assumes no responsibility for unsolicited material, nor responsibility for content of any advertisement, particularly infringement of copyrights, trademarks, intellectual property rights and patents, nor liability for misrepresentations, false or misleading statements and illustrations. These are the sole responsibility of the advertiser. Opinions of the writers are not necessarily those of the SUT or the publishers. Turritella FPSO SBM Offshore is exercising its right under the charter agreement to purchase the FPSO Turritella from SBM. The purchase allows Shell to assume operatorship of the Stones development in its entirety. The FPSO Turritella has been on hire since 2016 and forms an early phase in Shell’s Stones development in the Gulf of Mexico. Stones is located in 2896m (9500ft) of water approximately 320km (200 miles) offshore Louisiana in the Walker Ridge area. FPSO Turritella is FPSO Turritella the deepest FPSO development in the world and has a turret with a disconnectable buoy allowing it to weathervane in normal conditions and disconnect from the FPSO upon the approach of a hurricane. Visund TechnipFMC has been awarded an extension to its ongoing Engineering, Procurement and Construction (EPC) contract from Statoil in the Norwegian North Sea. The ongoing EPC project covers the provision of subsea equipment including template structure, manifold and two subsea trees including wellheads and modifications of control systems to the Visund Nord IOR project, whereas the extension includes installation of the template structure and manifold as well as delivery and installation of flowline spool and umbilical. The project will be executed as an integrated Engineering, Procurement, Construction and Installation (iEPCI). l TechnipFMC has entered into a three-year frame agreement with Woodside Energy Ltd in Australia for Riserless Light Well Intervention (RLWI) and subsea services, including intervention, installation, and plug and abandonment services. Under the agreement, TechnipFMC will initially perform installation and RLWI services in the Greater Western Flank Phase 2 (GWF-2) development, located approximately 175 km northwest of Dampier, Western Australia. TechnipFMC will install subsea trees and deploy its deepwater RLWI stack to perform well intervention services on up to eight subsea wells in the GWF-2 development. This is the second RLWI project for TechnipFMC in Australia and builds upon TechnipFMC’s 400+ wells. NEWS Total is to purchase Maersk's oil and gas business in a $7.45 billion. This move will give the French operator the ability to raise its output to 3 million barrels per day by 2019. Maersk Oil has reserves equivalent to around 1 billion barrels of oil.The deal is expected to continue until the first quarter of 2018. "It was time for us to do what a real oil and gas company would do in a period such as this when prices are lower and costs are down. Either launch new projects or acquire new reserves at attractive prices," Total Chief Executive Patrick Pouyanne said. According to Reuters, Analysts from Raymond James said the value of the deal appeared fair with Total paying $13.4 per barrel of reserves – in line with what Royal Dutch/Shell paid to acquire its rival BG in the biggest oil transaction of the past decade in 2015. l Royal Boskalis Westminster has acquired all shares of the Gardline. With the acquisition Boskalis fulfils its strategic ambition to build a position in the offshore survey market and becomes a specialist provider of subsea geotechnical surveys with an exposure to the renewables market and the early cyclical oil and gas market. The consideration paid including assumed debt amounts to approximately £40 million. l Actuant will sell its Viking SeaTech business to Acteon for about $12 million. Actuant will also purchase Mirage from Acteon for approximately $16 million, plus potential future performance based consideration. l DeepOcean has acquired French company Searov Offshore SAS and has expanded its presence in West Africa. Searov is an ROV service provider with a strong focus on West Africa. The company owns and operates ten Remote Operated Vehicles (ROVs) from its operating bases in Pointe Noire, Congo and Port Gentil, Gabon. Searov has a proven track record of delivering inspection, maintenance and repair and construction support services to a variety of international oil companies in West Africa. l Forum Energy Technologies has acquired Global Tubing from its joint venture partner Quantum Energy Partners. Global Tubing provides coiled tubing, coiled line pipe and related services to customers worldwide. l TELE-FONIKA Kable has acquired TELE-FONIKA Kable has acquired subsea umbilicals and power cables supplier from Vision Capital. Otter EPCIC OneSubsea has announced the award of an engineering, procurement, construction, installation and commissioning (EPCIC) contract for a subsea multiphase boosting system by TAQA for the Otter field in the UK North Sea. Through the EPCIC contract, OneSubsea and its Subsea Integration Alliance partner, Subsea 7, will supply and install a subsea multiphase boosting system including topside and subsea controls, as well as associated life-of-field services. The project will result in a 30-km subsea tieback to the TAQA-operated North Cormorant platform. This will be the longest subsea multiphase boosting tieback in the UK North Sea. “This fit-for-purpose subsea boosting system will improve TAQA’s ultimate recovery from an existing asset, through a capital-efficient long tieback,” said Mike Garding, president, OneSubsea, Schlumberger. Otter is developed by five wells (three oil producers and two water injectors) tied-back to the Eider platform by a 13mile-long (21km), 10in production flowline. The flowline is one of the longest subsea tiebacks in the North Sea. Statoil will develop the Norwegian Sea Snefrid Nord field as a tieback to Aasta Hansteen through the Luva template 6km away. The discovery, scheduled to come on stream in late 2019. Aker Solutions will deliver the single-slot subsea template, a suction anchor and umbilicals for the Snefrid Nord development. Ultra Deep Solutions has launched its DP2 Multipurpose Diving Support Vessel Van Gogh. Subsea 7 will deliver flowlines and spools in addition to performing all subsea installations. Snefrid Nord was discovered in 2015. Recoverable reserves are estimated at about five billion cubic metres of gas. The development concept includes one well in a single-slot subsea template. The planned productive life being 5-6 years. The capital expenditures for the Snefrid Nord development total about NOK 1.2 billion. With an 18 men twin bell saturation system for depth down to 300m, the Van Gogh has its own moonpool, an air diving system, and fitted with one work class and one observation remotely operated vehicle with LARS. A large platform deck 1300 m2 deck space suitable for wellhead servicing, inspection and construction diving and ROV support. The vessel accommodates up to Van Gogh 130 personnel. Gina Krog Statoil recently started production on the Gina Krog oil and gas field in the North Sea following an investment of some NOK 31 billion. The Gina Krog platform is tied in to Sleipner A and uses both processing capacity on the platform and existing pipelines for sending the gas to the marked in Europe. Oil from the field is transported by a floating storage and offloading unit (FSO) which will be located on the field. Gina Krog was initially a smallsize gas discovery made in 1974. In 2007 and 2008 oil was struck, which, Statoil say, shows the importance of near-field exploration. Gina Krog will help extend the productive life and maintain jobs at Sleipner A and Kårstø. from existing fields thus maximizing the return for clients while ensuring recoverable resources are not left in the ground. The programme which includes the manufacturing, testing and qualification of complete power modules in a system configuration is currently in its final stage before the solutions will be commercially available to offshore oil and gas operators. Field Development: BP Juniper Gas projects in Australia and Trinidad are fourth and fifth of seven major projects start-ups BP expects in 2017 BP today confirmed the start of production from another two of the seven Upstream major projects that it expects to come online in 2017. Five of these seven projects have now started up. Juniper in Trinidad and Persephone in Australia follow the start-ups earlier this year of the first phase of the West Nile Delta development in Egypt, the Trinidad Onshore Compression project and the Quad 204 redevelopment in the UK. A further two projects – the first phase of the Khazzan tight gas development in Oman and development of the Zohr gas field offshore Egypt – are expected to begin production before the end of the year. Gas production from Juniper began on schedule and under budget. The largest new project to start up in Trinidad for several years and BP’s first subsea field development in Trinidad, Juniper is expected to boost BP Trinidad and Tobago’s (BPTT) gas production capacity by around 590 million standard cubic feet a day (mmscfd). The development produces gas from the Corallita and Lantana fields via the new Juniper platform, 80 kilometres off the south-east coast of Trinidad in water approximately 110 metres deep. Gas then flows to the Mahogany B hub via a new 10km flowline. Juniper is BPTT’s 14th offshore platform in Trinidad. The Persephone project off the coast of Western Australia is operated by Woodside Energy and is part of the North West Shelf Project joint venture. The development comprises two subsea wells tied back to the existing North Rankin complex by a 7km flowline. Located about 140km north-west of Karratha, Western Australia in water depth of around 125 metres, at peak production the project is expected to produce around 48 mmscfd of gas net for BP. BP holds a 16.67% interest in Persephone. West White Rose A General Partnership (GP) between SNC-Lavalin, Dragados Canada and Pennecon has been awarded a construction contract from Husky Energy as part of the companyâ&#x20AC;&#x2122;s West White Rose Project in Newfoundland and Labrador. The GP will build a concrete gravity structure (CGS) for a fixed drilling platform. The CGS, with an overall height of 145m and base diameter of 122m, will require 76,000m3 of concrete in its construction, which will take place in a purpose built dry dock from 2017 to 2021. Map of the present White Rose development Once completed and installed in the White Rose field, the CGS will support a topside module to enable drilling and oil extraction 350km away from the coast of Newfoundland in the Atlantic Ocean. As part of this GP, SNC-Lavalin and Dragados Canada each hold 40% of the shares, while local company Pennecon Ltd is a 20% partner. The structure will be built in Argentia, an industrial area on the southwest coast of the island of Newfoundland, before being moved offshore. Work on the project is expected to begin shortly and construction is expected to finish in 2021. The White Rose field and satellite extensions are located in the Jeanne dâ&#x20AC;&#x2122;Arc Basin, 350 km east of Newfoundland and Labrador in approximately 120 m of water First oil from the White Rose field was produced in November 2005 through excavated subsea drill centres, with flexible flowlines bringing production to a centralized floating production platform, the SeaRose FPSO (floating production, storage and offloading) vessel. The White Rose field was originally developed using subsea wells in two subsea drill centres; the Central Drill Centre (CDC) and the Southern Drill Centre (SDC). A third drill centre, the Northern Drill Centre (NDC), is used as an injection site for gas that is being stored for future use. West White Rose, the latest part of the White Rose Extension Project, was delineated in 2006. Husky had to decide between a subsea development and a wellhead platform. The WHP development option will include engineering, procurement, construction, fabrication, installation, commissioning, development drilling, operations and maintenance, and decommissioning activities. "The WHP will consist of a concrete gravity structure (CGS) with a topsides consisting of drilling facilities, wellheads and support services such as accommodations for 120 to 130 persons, utilities, flare boom and a helideck," said a spokesman. placed. Drilling of the wells would have used a semi- submersible drilling rig. The subsea drill centre would have been tied back to the SeaRose FPSO via the existing subsea infrastructure. The connections from new subsea drill centres to existing infrastructure had not been determined. Productive life of the subsea infrastructure will be 20 years, which is similar to the design life of the existing subsea infrastructure in the White Rose field. NEWS Kraken First oil from EnQuest's Kraken development was delivered in June 2017. During the initial ramp-up period, the 13 wells that have been drilled and completed to date, comprising 7 producers and 6 injectors, are being brought online in a phased manner to maximise long term productivity and value. Drill centres 1 and 2 are fully complete and work continues on drill centre 3; as a result, further production capacity will come online into 2018 as these further wells are put onstream. Kraken is a large heavy oil accumulation in the UK North Sea, located in the East Shetland basin, to the west of the North Viking Graben, approximately 125 km east of the Shetland Islands. The field contains 128MMboe of gross 2P reserves. Gross peak oil production expected to be approximately 50 000 b/d. Van Oord has been awarded a Letter of Intent in a joint venture with Boskalis, for rock placement services for the Nord Stream 2 project. The contract value is approximately â&#x201A;Ź250 million. Contract details are expected to be finalised imminently. Rock needs to be installed at specific locations along the pipeline route to level the seabed and to protect the pipelines. The contract scope includes the sourcing of rock from quarries in the Baltic region. Olympic Delta MMT has chartered a new vessel M/V Olympic Delta and invested in a second Surveyor Interceptor. Both initiatives will expand the possibility to meet increased customer demand for its services. and services that this new concept represents," said a spokesman. "The investment in Surveyor Inceptor is together with our partner Reach Subsea." NEWS VOS Start Upgrade Damen has bid farewell to VOS Start, Vroon BV’s first DP2, subsea-support, walk-to-work (W2W) vessel. The 80m VOS Start arrived at Oranjewerf on 1 June from her build yard in China for the installation of a motion-compensated gangway system - the first of its kind - by Barge Master and Bosch Rexroth, the extended installation of a Kongsberg reference system (including a ‘windfarm module’), and an active heave-compensated crane from SMST. In the eight weeks that she was in the yard, the vessel also underwent a wide range of other upgrades and preparations for her first charter. The VOS Start is the fourth in a series of new vessels for Vroon that they have brought to Oranjewerf for finishing off following their initial build in China. However, this is the first time that Damen Shiprepair Oranjewerf and Vroon have worked together on a W2W vessel and, with Barge Master and SMST both Dutch companies, it was logical to do the final installations in the Netherlands with all the necessary expertise and support close by. Other local specialist suppliers also contributed to what has been, owing to the W2W element, the most complex upgrade yet for a VOS subsea support vessel at Oranjewerf. These specialists included Niron Staal Amsterdam, another member of the Damen Shipyards Group, which fabricated two boat landing ladders which were then installed by Oranjewerf. Other equipment installed include a Lightweight Taut Wire, Radius and a Hipap position reference system, all manufactured by Kongsberg. The mountings necessary for up to eight temporary living units, supplied by H2M, were also fitted, along with many other modifications. VOS Start’s first project will be a charter to MHI Vestas Offshore Wind for the construction of the Walney Extension Offshore Wind Farm in the Irish Sea. There she will provide logistics support, accommodation and W2W capability. In August, Damen Shiprepair Rotterdam (DSR) delivered the FPSO Petrojarl 1 to Teekay Offshore following a complete redeployment project taking place over the past 2 Â˝ years. the process equipment was removed and replaced by new and additional equipment, required to treat heavy oil at the new location in accordance with the most stringent specifications and Brazilian compliance requirements. equipment skids containing heating, cooling, separation, compression, boilers, centrifuges as well as a new E-house with electrical equipment were placed on board. Buoyancy and Insulation Subsea buoyancy company Balmoral Offshore Engineering is currently expanding the range and prominence of insulation systems within its product portfolio. Technical Manager Gregg Stewart explains how buoyancy and certain insulation systems interplay. "Adding buoyancy is fundamental to a variety of subsea enterprises," he said. "It effectively offsets the mass of subsea structures, the engineering repercussions of which are many and varied, especially in deep waters. "In the oil and gas sector, this allows subsea hardware such as deepwater flowlines or risers to stay within predefined operating stress envelopes and avoid failure under their own weight. Similarly, buoyancy allows remotely operated vehicles (ROVs) to move as if they were virtually weightless. “Insulation systems, however, are more concerned with combating flow assurance issues that arise when hot well streams reach the seabed and abruptly confront the near-zero ambient temperatures of the surrounding seawater. Changes in the well stream's physical chemistry or various cool-down scenarios can cause flow restrictions within the pipe. Multiple insulation systems are available to counteract this.” The seemingly disparate demands of buoyancy and insulation share a common solution – syntactic foam. Syntactic foam is a phrase in common currency, however, many people do not fully understand exactly what it refers to. The syntactic part of the name – or more correctly pure syntactic, refers to high-strength, low-density hollow glass microspheres (HGMS) fully encapsulated in a resin matrix. The microspheres typically measure around 30-100 microns in diameter while resin system chemistries are wide-ranging and are selected depending on the attributes of the required pure syntactic. "The nonporous, chemically stable glass bubbles are central to a variety of processes," said Stewart. "In the oil industry alone, they can be incorporated into engineered polymers or added to alter properties of drilling muds and cements. There are several grades available, each having completely different density and hydrostatic pressure resistance properties. “When these transient microspheres are trapped in a resin, it significantly lowers the density of the neat resin system and enhances the collapse pressure of the microspheres allowing their use at extreme operating depths over service durations exceeding 25 years. “The manufacturing method, cure, cool-down and finishing techniques are tailored and entirely dependent on the selected resin system; careful consideration and control must be given to each of these manufacturing stages and the finished pure syntactic material can be moulded as a standalone product or can be cast into blocks which are bonded together and CNC machined into the required finished geometry.” Certain applications like distributed or drilling riser buoyancy require more buoyancy than ‘pure syntactic’ can provide. One solution is to encapsulate, larger buoyancy spheres called macrospheres, within the pure syntactic matrix. This reduces the overall density of the mix and therefore provides much greater uplift to the total system. Syntactic foam is the name given when these macrospheres are fully encapsulated in a pure syntactic. "We manufacture proprietary macrospheres on-site from a variety of chemistries in combination with several reinforcing fibres," said Stewart, "but the selection is again entirely dependent on the end-use application and service conditions. "Additionally, we have patented a specific type of buoyancy sphere which boasts ultra-low density and high burst performance; these are selected where there is a high uplift requirement that could otherwise not be achievable with traditional macrospheres. "We must keep cost in mind and systems are selected to provide the customer with the most economical solution that meets their requirements. Technical performance has to be balanced against system costs. “The basic principles of buoyancy system qualification, selection and manufacture have not radically changed over the years. What has changed, however, are the engineering design and testing processes to ensure the buoyancy supplied is fit for purpose over its service life as well as enhanced requirements for independent third party verification of design processes, manufacturing and testing. “The industry is moving into increasingly deeper waters and for these extreme depths we have developed systems that can deliver the performance to meet the new demands. "The skill lies in developing and matching the best pure syntactic with the optimal macrosphere combination to give the appropriate density and uplift while being as economic as possible. So which system is better for insulation and which for buoyancy? "For distributed and drilling riser buoyancy, syntactic foam is almost always the best option due to the presence of the macrospheres which lower the overall density of the system, but there are occasions where offering a syntactic foam solution is not favourable. "Again the choice is totally dependent on buoyancy operating conditions, safety factors and customer requirements. “Distributed buoyancy modules (DBMs) are installed onto risers at specific locations in order to achieve a particular pipe configuration, steep/ lazy/w-wave etc, to reduce topside or tension loads. These DBMs are supplied as two polyethylene half shells filled with an appropriate syntactic foam which are strapped around a clamp. The clamp is then secured to the riser. Typical operating depths for these are 150-3000msw, however systems are available for depths to 5000msw. Typical service lives for these products are 20-25 years. “DRBMs are installed onto the rigid string during operations and are supplied in pairs. The syntactic foam in this case is held within a glass reinforced epoxy skin which provides excellent impact performance during their much shorter service lives. "Designing insulation systems can be a little trickier and it is largely down to the much higher operating temperature conditions that the syntactic is exposed to. "In some applications, the insulation material may have to physically touch the hot pipe, or the cavity between the insulation and the pipe surface may be flooded, resulting in hot-wet conditions. "A consideration must, therefore, be given for this in resin selection to provide the required performance over a 25 year operating lifetime. The key is to retain a low thermal conductivity to ensure heat is retained within the structure throughout its service life. “An added complication for syntactic insulation systems operating at very high temperatures in seawater is that the hollow glass microspheres can dissolve. This allows water to fill the interstitial spaces left behind, causing the thermal conductivity of the system to increase over the service duration. “In these situations, depending on operating temperatures and conditions, systems containing no hollow glass microspheres can be used, although the ‘start of life’ thermal conductivity is higher than a system containing hollow glass microspheres, it is maintained over the service duration. For syntactic insulation systems it is therefore critically important to use a high temperature and hydrolysis resistant matrix.” In the late 1990s Balmoral developed a combined buoyancy and insulation system for the hybrid riser tower and flooded sealine bundle on the Girassol project offshore West Africa. At 1350msw this was the deepest field development the industry had seen at the time. Subsea LiDAR 3D at Depthâ&#x20AC;&#x2122;s Subsea Light Detection and Ranging (LiDAR) technology is used to acquire 3D models of underwater assets, resources and natural features. Each 3D data set provides millimetric, measurable, repeatable point clouds delivered in an e-57 industry standard format. transmitted pulse of light takes to travel to an object and back after reflection. The two-way travel time and intensity of the reflected light is measured. This time of flight (ToF) measurement requires specialised photodetectors and accurate timing measurement since light travels at approximately 300 000km/s. specific wavelengths, pulse widths, pulse repetition rates and power for specific applications. Scanning an environment using Subsea LiDAR is accomplished by a laser that is swept in multiple directions using servo mirrors. Photodetectors record the laser pulses that return to the system and high-speed electronics quantify the time of flight and intensity. want to build, maintain, map and monitor underwater infrastructure,” said Neil Manning, Chief Business Development Officer, 3D at Depth. Using 3D at Depth's scanning technology, Alexander Armstrong and Dr Michael Scott presented a programme on BBC showing the hidden history of Italian civilisation and city life. very close correlation with existing static-scanned point cloud data for the same field. The results looked impressive enough to offer IMCA tolerances for spoolpiece metrology. Additional testing for this application will continue in the future. This follows a series of trials on collecting LiDAR data from a wide range of moving platforms at various depths. An additional project integrated and collected motion compensated subsea LiDAR data from an oilfield in water depths greater than 2000m. “It validated INS aided subsea LiDAR for a variety of applications including field mapping and spool metrology out of straightness,” said Manning. “Based on the results, the have companies developed a commercial version which has been available for field mapping projects since the beginning of April. We will continue to build on the success of this with other projects. Temperature may be increased as a manifestation of the fatigue of the inside of the umbilical or flow line.” Subsea LiDAR as enabling technology can work across life-of-field applications to increase efficiencies and leverage resource allocation. 3D Laser Imaging In recent years, the underwater community has become increasingly aware of the capabilities offered by 3D subsea laser imaging systems. One company that has been in the forefront in developing this technology is Savante Offshore. While it has been carrying out high resolution 3D laser surveys for clients for over 14 years, it now recognises that the time is right to start selling 3D measurement systems outright. Fundamentally, there are three basic types of 3D subsea laser measurement systems. Savante's owner, Dr. Grant Thomson, explains the comparative differences between them. "Perhaps the oldest method, established since the 1980s, is called LiDAR. It works on the principle of time-of-flight measurement. This is a close technical analogue to sonar," he said. "A narrow pulse of light is emitted from a laser, transmits through the water column onto an object and an optical system collects the scattered light, focussing it onto a high speed photodetector." Electronics clock exactly when the energy pulses return and the corresponding transit time. Distance measurements are, to a first order approximation, a measurement of that interval transit time corrected by a parameter related to the reflective index of water. "This was the sort of technology largely pioneered in the nineties in the field of biomedical fluorescence imaging," said Thomson, "but the technology has since been transferred to the subsea sector. "It was also the basis of the first laser scanner I encountered in 1993 as a high school student on work-experience placement with an Aberdeen-based oil operator." LIDAR is now a mature technology; lasers capable of emitting nanosecond or pico-second pulses, as well as integrated photodetectors, scanning optics and time-resolved measurement electronics, are now commercially available at a modular basis and can be assembled into a high specification device. The technology has benefits of longrange operation, great performance in ambient light and in turbid water but at the time, had a practical resolution of around a few millimetres. Whilst it is interesting, it also presented a high cost threshold for development. resultant distance data had a strange non-linear relationship with known measured distance from that target; which also had to be orientated in a very specific manner in order to get a good return with good repeatability. "Whilst these were not insurmountable problems, at the time, we concluded that whilst there was probably an application somewhere in the subsea industry we were not convinced that it would give the sort of detailed reproduction and measurement speed we were looking for." of success here and our laser tools are also commonly found on pipeline inspection surveys. We have also operated in support of trenching operations using our laser profilers. "In the most turbid of waters however laser energy just gets scattered and absorbed. However, given that laser light is projected along a very narrow plane; the sight of our laser stripe from an offset camera is often the last thing seen on the piloting footage before you lose visibility completely. It is however only an marginal improvement over halogen or LED lighting. "In particularly clean water, we have been able to conduct laser triangulation measurements beyond 30m, but with the exception of conducting wide area reef surveys, we have rarely found applications that can justify the selection of laser triangulation over an acoustic multibeam or LIDAR approach. "Longer range measurement also necessitates the use of more powerful lasers. Our commercially-driven preference has been to operate in markets where we can provide value through disruptive technical differentiation." most people will be working half that distance – a distance that an ROV pilot would be happy working with. "At that range," said Thomson, "the resolution of our laser scanners becomes exceptionally better than any other technology on the market. "In terms of applications for triangulation-based systems, we have been using it to inspect assets and seabed habitats in every major oil basin." itself so that a most-likely interfacing product from the 70's period could be identified. micro-ROV which makes it particularly useful in close-quarter constrained environments." damage on the inside of a subsea well head â&#x20AC;&#x201C; something nobody had done before. Another project involved modelling the distribution of drill cuttings on the sea-floor around a jacket and within the cells of a concrete gravity base structure. In internal caisson inspection, locating the scanner against circumferential welds and scanning 360Â° around allows the user to reconstitute the surface shape. From this, it is possible to detect progressive degradation features such as surface breaking defects and preferential weld root corrosion.
" We competed with a range of other companies using novel alternative technologies (such as video-derived measurements and in-situ impressioncasting tools) but only we were able to determine the full extent of the damage. While we were developing the technology, we made the executive decision that we would not sell the laser scanning devices but carry out the work ourselves using our expertise to get the best out of the equipment. The market has now changed and we have accepted that this year, we have decided to sell the hardware. The reason for that is that the market is now maturing and we are winning acceptance across the board. Subsea Cutting Laser The Welding Institute (TWI) has commenced a new project to advance the decommissioning of offshore structures. As a result of the Energy Act of 2008, there is a need to decommission a large number of the North Seaâ&#x20AC;&#x2122;s oil and gas infrastructure over the next 30 years, including some 600 fixed steel structures and 3000 pipelines. In order to improve the flexibility, speed, and reliability of the process, TWI is developing a low-cost decommissioning technology for use in deep and hazardous waters. This will consist of a high-speed, flexible laser cutting solution that can be deployed remotely to avoid the need for divers. This technology should not only reduce the time taken to deploy when compared to competing methods, but also minimise the cost of subsea decommissioning. The project will see the development of a prototype tooling system alongside UW laser cutting technology that will be effective for cutting 50mm thickness of mild steel at depths of up to 100m. When the technology and processes are in place, the SubSeaLase capabilities can be developed towards a post-project use. existing methods by removing the need for divers due to the deployment of the ROV mounted with an underwater cutting head and fibre-delivered laser source and gas compressor, which will remain topside. SubSeaLase is a UK collaborative project, funded by Innovate UK. approaching what humans see in air. "This new technology will enable us to virtually explore underwater worlds, such as those around hydrothermal vent sites," says Lange, "and help us better understand the structure and longevity of submerged objects, such as pipelines and sunken maritime heritage sites." Currently, 3-D models take months of processing back in the lab. But the new underwater imaging system will make the models possible in shorter periods of time—even during expeditions at sea. "This is really exciting because the deep sea is a realm with very limited access," says Tim Shank, a deep-sea biologist at WHOI. "Even when scientists are able to dive in a submersible, like the Human Occupied Vehicle Alvin, we typically have just a few hours on the seafloor per day. Due to the great pressures that increase with ocean depth, it's impossible to step out of the sub and experience the terrain and its thriving ecosystems in three dimensions." "These high-resolution 3-D models will allow us to visually walk through the seafloor landscape among the biological communities that live there, much like a wildlife biologist would walk through a rain forest," adds Shank, who plans to collaborate with AIVL to generate 3-D models of deep-sea coral ecosystems off the coast of Colombia during an expedition there later this year. Typically, after a research expedition at sea, scientists spend weeks reviewing still images and video gathered by underwater vehicles or other instruments. Lange says the new models will help streamline the process of interpreting data. "Instead of having to look at hundreds of thousands of individual images, scientists can examine a single high-resolution 3-D optical model," Lange says. "It allows them to see depth, scale and context, which is what most scientists like about being able to dive in a manned submersible, such as Alvin." Subsea Lasers Science community acquires oceanographic instruments from MacArtney MacArtney has secured an order for LISST instruments from University of Bergen, Norway. LISST instruments are manufactured by Seattle based oceanographic instrument manufacturer, Sequoia Scientific, Inc. They are used for environmental monitoring, industrial, and scientific applications across the globe. The unique submersible LISSTs help engineers, scientists, and monitoring agencies reliably measure the concentration and size of sediment, plankton, and oil droplets in any water body. The order placed by University of Bergen with MacArtney consists of the LISST instruments LISST-VSF and LISST-200X. These products are to be used in the sea close to the Lofoten Islands in northern Norway for water optical property studies. The LISST-VSF is the most advanced submersible in-situ optical instrument in the world. It measures the volume scattering function (VSF) of water with depolarisation capabilities. LISST-200X submersible laser particle sizer These measurements are used by oceanographers and physicists to develop models for light propagation in water. Ultimately, such measurements can lead to improved and more accurate environmental monitoring and understanding of the aquatic environment. laser particle sizer. Since 1995, the LISST-200X predecessors, the LISST-100 and LISST-100X, have been used by aquatic engineers and scientists all over the world to study eg, sediment transport, dredge plumes, algae growth, and oil droplet dispersion. Additionally, the depolarisation capabilities has potential for discrimination between particle types and shapes. The LISST-200X adds on to the capabilities of the LISST-100X by measuring particles in a wider size range, at larger concentrations, having a better depth rating, and with the ability to provide realtime output of mean particle size and concentration. In addition to the two instruments, supplied complete with battery packs, the order comprises MacArtney deployment frames for both instruments. It also includes a two-day on-site training course in Bergen headed by MacArtney personnel. The training sessions will comprise both theoretical and practical sessions covering the fundamentals of light scattering as well as instrument deployment and subsequent data processping and interpretation. SUT YES! Cyber Security in Oil and Gas Report on YES! Event Rigby’s Bar & Grill, Rear 221 St Georges Terrace, Perth, Thursday, 25th May 2017 Kelsie Clarke, SUT YES! Vice Chair/ Secretary/Committee Member At a time where the WannaCry cyber-attack was still warm in the news, the Society of Underwater Technology (SUT) Young Engineers and Scientist (YES!) group recently hosted an event on Cyber Security in Oil and Gas. With a diverse and stellar line-up of speakers from Woodside, Cisco Systems, Honeywell and GE Digital, the evening was informative and engaging, generating discussion and take away actions from the audience. The presentations explored a dynamic range of topics, from Operational Technology (OT) Vs. (IT), subsea and well control systems, what to look for in Cyber-attacks, how to mitigate against attacks and the current and future challenges that the Oil and Gas industry will face. Speakers Andrea Kesterson and Loai Khalayli from Woodside kicked off the evening, with a presentation titled 'Cyber Attack on Your Umbilicals'. Next on the agenda was David De Lima from Cisco with ‘Cyber Security for an IoT (Internet of Things) World’, followed by Nathan Formby from GE Digital who examined the topic ‘Is Your Industrial Data Safe’. The evening was wrapped up by Mirel Sehic from Honeywell who talked to the forward looking statement ‘Cyber Security – Are we there yet?’ followed by questions from the audience to the panel of speakers. The message that really shone through over the evening was that practicing vigilance and keeping our organisations up to date with current protections and technologies is key to being protected against a cyber-attack. The question is not whether organisations will experience a cyber-attack or not, but a matter of when. Vulnerabilities do exist within all IT and OT systems, so it is so important that the industry collaborates to protect everyone within this space. From left to right: Nathan Formby (GE Digital), David De Lima (C isco), Mirel Sehic (Honeywell), Loai Khalayli and Andrea Kesterson (both Woodside). Stingray Laser Parasitic lice have become a problem to salmon fisheries, one that the fish-farmers have been spending $1 billion annually trying to battle. "The shrimp-like fish parasite blossoms when it faces a large biomass in the same place," said John Breivik, general manager at Stingray," which is what we have with high density fish farms." Stingray has developed an automated drone with cameras and laser, that can be fitted into a salmon pen. Image recognition software detects the sea lice as the fish swims by. This is connected to a laser which sends a guided pulse of around 100 milliseconds. This destroys the lice. "Because the salmon's scales are reflective, the laser bounces off leaving the fish unharmed," said Breivik. "The parasite, however, absorbs the full energy of the blast. The laser is good for a distance of two metres. One device can kill tens of thousands of lice in a single day." Acoustic Technology Sentinel Technology Maritime security company Sonardyne International, has reached the latest delivery milestone in a contract to supply a fleet of Offshore Patrol Vessels (OPVs) under construction in the Far East, with its diver detection sonar technology, Sentinel. Ocean Gliders How Gliders Work In around 250 BC, Archimedes famously declared that any object immersed in a fluid will be buoyed up by a force equal to the weight of the fluid that the object displaces. Now known as Archimedes' Principle, he went on to explain that if the density of the object is the same as the density of the surrounding fluid, it is described as neutrally buoyant. If the density of an object is less than that of the surrounding fluid, the object rises while conversely, if it object has a greater density, it sinks. The subsea glider works by ingeniously controlling this density variation to make it rise and sink on demand. "Letâ&#x20AC;&#x2122;s imagine you have an inflatable bladder extending out of the back of a glider shell," said Romain Tricarico, International Sales Manager of SeaExplorer glider manufacturer ALSEAMAR. The bladder is filled with enough oil to allow the vehicle to dive underwater and float. When at the surface, the glider is neutrally buoyant and just floats as his density is equal to the water density "When the oil in the bladder gets into the glider inner tank, the overall volume changes. The mass of the glider remains the same. Density is calculated as mass per volume, so the decrease in volume means a corresponding increase in density. This causes the vehicle to sink by gravitational forces." In order for the glider to progress down the water column, the vertical sinking movement has to be converted into a controlled horizontal motion. This can be accomplished by relocating mass within the glider's hull forward. Changes in the centre of gravity result in pitch up/down. Rotation is also facilitated by the wings or tail fins of the glider. Its hydrodynamic shape provides minimal resistance through the water while the external wings or fins increase directional stability and lift, and eliminate yaw rotation. When it reaches the required depth, the bladder is triggered to inflate. With the greater volume, the decrease in density and positive pitch angle it brings the glider back to the surface. The glider then naturally rises, nose-up, back to the surface to start the next cycle. The rising-falling movement that the vehicle makes through the water is often described as a sawtooth profile. The glider typically travels at a speed in the order of 25cm/sec. At the apex of the profile, the glider may break surface and transmit data to the onshore pilot via satellite. The balance of the glider is so sensitive, that only a slight fluid displacement can be enough to make the descending vehicle rise and vice versa. Unlike other AUV platforms with power-consuming thrusters, a glider can last a very long time on a single battery charge because it only uses energy on scarce phases to inflate or deflate its bladder and adjusts its attitude. The consequent long endurance makes it capable of carrying out surveys at very low costs. They can go places where it is impractical to send manned or freeswimming vehicles that requires support. They can work, for example, in arctic waters or even through tropical storms. One of the main part of a glider is its sensor package. The payload size is an important criteria in determining the most suitable sensor suite. Sensors typically monitor temperature, salinity, currents, oxygen and chlorophyll, but new parameters like hydrocarbon, micro-nutrients, etc, also available. In a nutshell, underwater gliders are powerful autonomous sensing platforms designed to collect water column data profiles with very wide spatio-temporal coverage (thousands of kilometres and endurance measured in weeks and even months). Seaglider In 2013, Kongsberg acquired the commercial license to produce, market and further develop the technology behind the Seaglider. Seaglider was developed in 1997 by researchers at the School of Oceanography and Applied Physics Laboratory. Kongsberg picked up where previous licensee iRobot left off, handling orders for external customers. significantly stratified waters. It also enables the glider to generate up to 1kt of forward velocity, making it easier to operate in areas of relatively high current. Ocean Gliders Exocetus Last year, the developer of the subsea glider Exocetus sold the intellectual property and manufacturing rights of its underwater vehicle to Connecticut-based engineers following a history of non-technical issues. The new company, Exocetus Autonomous Systems, is now looking to commercialise the $15 million in research and development that was invested in the vehicle. Exocetus excursions to the surface for data telemetry. The larger buoyancy engine gives the Exocetus a top speed of 2kt, making it one of the fastest on the market. The engine also includes an adaptive system so that if the glider encounters changing water conditions, specific salinity or density, the vehicle can both recognise and automatically adjust the ballast using the engine. "It doesn't need a salinity sensor for this, it simply recognises that is not moving as well and not making the progress it should do and automatically adjusts. At the front is an altimeter that measures height off bottom." "The alkaline battery system, powering the glider weighs 70lbs and hold about 4000W hours of power or 14 MJ. There is also a lithium option which gives 18 500W hours or 67MJ. The selection depends on the load and the programme duration. "At a travel speed of 2kts, a lithium system is good for around 1500 miles. The company has also partnered with GreenSea, a Vermont USA based software developer for ROVs and AUVs. Using GreenSea's OPENSEA platform, the company is able to provide a professional user interface and highly capable navigation software that is widely used throughout the industry. Weights within the nose The balance of the glider is critical. It is normally calibrated to seawater. In some cases, however, it is necessary to add or subtract weight to change its centre of buoyancy. Rather than having to make changes to the centre of the vehicle, the Slocum G3 has metal weights in the nose that can be added or removed to fine-tune the trim. Ocean Gliders the glider to get through density structures and increases the speed of the vehicle. enter water of a different density can cause the glider movement to stall," said Jones. Freshwater lensing – when the glider suddenly encounters bodies of fresh water within a body of sea water - is a recognised issue within the glider operation. This typically happens when freshwater from a river enters the sea and causes a marked difference in density. It is not a common problem, but it can have serious ramifications if there are no remedial procedures. Some gliders face this conundrum by incorporating a larger buoyancy engine. The G3 has a buoyancy engine of 900cc but this is supported by a propeller. "This gives the design an advantage. Using a typical buoyancy engine allows an average speed of 0.5m/sec or around 1kt. Using the propeller, however, allows the vehicle to achieve double that with speeds up to 2kts. "This, in turn, gives us more control in areas such as the gulf stream, in which has its own currents that may need to be overcome. "While this can consume battery life significantly, it can be useful if the if the mission demands the glider gets from A to B. It gives the vehicle greater flexibility. their life easier through improvements and new features designed to better meet their operational needs”, said Romain Tricarico. "One of the first features we decided to specify were rechargeable batteries. Many customers reported that it was laborious to open up the glider in order to replace primary batteries after each mission. It was also expensive. accomplished without rebalancing and recalibrating the vehicle. There is no change in the magnetic field environment as its always the same battery. The threaded rod also acts as a pivot around which, the battery pack can rock port and starboard. This helps in allowing the glider to adjust any roll. In many ocean-going long distance gliders, the variable buoyancy is around 0.5–0.8 litres. The SeaExplorer, however, uses a litre bladder, which gives the ability to face stronger currents and also higher density gradients. The vehicle is yellow and black. Essentially, the yellow section is a dry while the black denotes the wet sections in which water can enter. The hull is large enough to incorporate a large range of sensors. This contains the classic conductivity temperature depth (CTD) sensors, but also others such as dissolved oxygen or hydrophones for acoustic recordings for Marine mammal assessment. The acoustic systems can equally be used for defence-related applications such as listening for submarines. With methane or hydrocarbon sensors, the gliders can be used for mapping seeps or larger pollutions such as oil spill. Next to the payload bay in the main body are the batteries. These are connected to a threaded rod. By turning this rod, the screw mechanism pushes the battery backwards and forwards to facilitate the descent/ascent. BRIDGES is an acronym for Bringing together Industry for the Development of Glider Environmental Services, a project launched as part of the European Union's Horizon 2020 research and innovation programme. Its aim is to carry out research into autonomous platforms armed with surveying and monitoring capabilities in order to support the long-term in-situ exploration and protection services of the coastal and deep ocean. technological innovations," said a spokesman. The intention is to develop two new vehicles. The idea is to increase the maximum operating depth and sensor payload in order to deliver a range of gliders targeting key markets and enabling operation at all depths. "Most gliders travel in a sawtooth movement profiles," said a spokesman, "however, this may be problematic for key markets, such as sea bed survey and plume mapping. "The two new deepwater gliders will have hybrid propulsion with not only a buoyancy engine, but also a propeller. There will also be a novel management of the payload power consumption suitable to increase endurance and to accommodate the range of sensing capabilities needed for each kind of service." BRIDGES AIMS Apart from developing the glider technology, BRIDGES is involved in â&#x20AC;˘ Enhancing sensing capabilities with novel, sophisticated payloads to demonstrate exploration and monitoring service capabilities for a wide range of science and industry domains. The first is called the DeepExplorer. The SeaExplorer glider is rated to 700m. The DeepExplorer, however, will operate at depths up to 2400m. The second, designed to operate at nearer 6000m, will be called the UltraDeepExplorer. This will take advantage from advances in ultradeep water technology coming from the AutoSub-2 AUV project. DeepExplorer resources exploitation, and Oil and Gas and sea mining packages. Some packages will look at natural and anthropogenic dissolved and particulate substances of sea water, and will include technologically mature sensors for optical properties and optical proxies. For the MSFD package, passive acoustics and an imaging camera will be considered for noise and (micro) litter respectively. Sensors to measure nitrate, phosphate, ammonia and silicate will be the basis of the package for living resources exploitation. Thanks to new development, a tool for sampling should be available for this system. The O&G package is expected to integrate sensors for detecting polycyclic aromatic hydrocarbons, crude oil, refined oil, turbidity, and noise levels. The sea mining package will host turbidity, particle counter, video and active acoustic sensors (for sea bed properties and sub-bottom stratigraphy). â&#x20AC;˘ Developing on-board and on-shore intelligent management systems to provide a high level of autonomy for gliders and glider fleets, and to act as an additional sensing component of monitoring systems for science and industry services. â&#x20AC;˘ Standardisation of glider data and hardware to facilitate the exploitation and commercialisation of the platform and resulting data products, including integration into national, regional and global observing systems. Call for Papers ‘The Leading Edge of Value-Based Subsea Inspection’ The Society for Underwater Technology, The Hydrographic Society in Scotland and The International Marine Contractors Association are holding our popular annual joint seminar on 1st November 2017 in Aberdeen. Much like other industries we have experienced a tremendous rate of development in technological capability which has enhanced the efficiency of our operations. These include a significant decline in the cost of data processing and storage, miniaturisation of subsea sensors, increased computing capacity, quick, reliable, wireless communications, increased utilization of subsea robotics and sophisticated data analytics and artificial intelligence. However, within a cost constrained environment stakeholders must drive development towards a value based solution. Therefore, the topic of this seminar: ‘The Leading Edge of Value-Based Subsea Inspection’ aims at identifying these innovative methods, and sensors that are focused at providing solutions to the challenges of subsea inspection and surveillance. The ability of advanced software analysis capabilities to produce high performance, robust and dependable solutions is revolutionising deep water drilling and production. By increasing the performance of products before they even enter the water, companies using software analysis capabilities are able to provide the solutions needed to combat the increasing harsh environments presented by the offshore world. Advancing Product Development As companies move to ultra-deep waters the technology they use has evolved. Extensive engineering design work is now performed using specialized software to produce local and global finite element (FE) and computational fluid dynamics (CFD) analysis to develop optimum designs. The ability to model equipment and system responses to environmental forces helps advance product development and design opportunities to maximize operational efficiency. Companies with in-house analysis teams can simulate offshore drilling operations, offering customers solutions considering a fully coupled vessel to well approach. These riser studies can specifically be used to assist clients in defining operational methodologies and structural system limitations. Drilling in Deeper Waters For decades, the offshore drilling industry has utilized drilling riser buoyancy modules (DRBMs) to reduce the overall riser weight and required top tension. DRBMs are highly effective at adding necessary uplift to drilling risers however, the associated drawback is increased overall outer diameters. Consequences from the phenomenon of riser vortex induced vibration (VIV) develop from a complex interaction between the riser structure and the flow field around the riser. These forces induce periodic oscillations or vibrations of the riser, transmitting large amounts of dynamic strain from the riser system to subsea equipment. dynamic loading transferred to subsea equipment and conductor casing programs from the riser, potentially increasing the integrity and life span of critical well containment equipment. Possible benefits of reducing riser drag and VIV by re-engineering drill riser buoyancy are numerous. turbulence into the downstream wake profile of the drilling riser. Axial flow paths result in forces that act out of plane of cross flow lift forces and in-line drag forces disrupting the cyclical rotation of these forces on the downstream side of the riser. Analytical Modeling Extensive engineering design work has been performed on the inverted helical groove geometry through numerical modelling in CFD software packages to develop optimum designs. Three dimensional finite element models developed for use in CFD analysis help to illuminate additional benefits realized from the inverted helical design. Conclusion By using advanced software analysis, companies can continue to revolutionize deep water drilling and production in increasingly demanding environments. Software analysis coupled with the advancement of riser drag reduction and VIV suppression technology, provides an integrated solution to progressing drilling riser buoyancy. Solution-specific engineering of the inverted helical module will facilitate the ability of drilling vessels around the globe to continue to deliver the energy needs of the future. Two bigger anchors of 18 tons in size were built and shipped to the United Arab Emirates and Australia. The anchor in UAE is currently being used by a rock cutter suction dredger on cemented soils and calcarenite bedrock. Following two years of development and testing, Vryhof Anchors has launched the STEVSHARK REX. This drag embedded anchors can be used in super-strong soils. The main goal of developing the STEVSHARK REX was to expand the suitability domain of drag embedment anchors in challenging geotechnical areas. total of 15 tests were carried out at three locations selected by a major Norwegian oil operator. The selected test locations are famed for their anchoring problems where the MODUs had to use piggy-back anchors to reach the required holding capacity. The initial are positive. The anchor in Australia shall be tested soon in areas with hard soils and carbonate rocks. The test sites are selected in collaboration with a major Australian oil operator. Afterwards, the anchor is scheduled to be used by MODUs, which will set the anchor in different fields with challenging soil properties. North Sea Interconnector Canyon Offshore has been awarded a contract for the provision of offshore cable trenching services on the North Sea Link Interconnector. The 1400MW subsea HVDC system with cables linking the UK and Norway when complete will be the world’s longest submarine interconnector. Blyth in England and Kvilldal in Norway. Canyon Offshore’s award will require the trenching of approximately 900km of the two interconnector HVDC cables which will have been laid onto the seabed by Prysmian. Estimated to cost €1.5-2 billion, North Sea Link is the first interconnector between the UK and Norway and will contribute to a more climate friendly energy system. Buoyancy, insulation and elastomer products With over 35 years’ experience in the oilﬁeld we have developed materials and provided engineered solutions to practically every deepwater project around the world. Our technical, engineering, procurement and manufacturing teams are full of highly qualified personnel, all brimming with ideas. Supported by senior personnel with unrivalled experience we believe we provide an industry-leading service. Benefit from the best product solutions with Balmoral engineered buoyancy, insulation and elastomer products. Leopard Dive Works have made savings through the imaginative deployment of their Saab Seaeye Leopard ROV. platform structure to slice through the metre-diameter steel pipe and remove it from the site. The Leopard performed seemingly impossible IRM work scope in Bass Strait which previously could only be achieved by large and expensive hydraulic systems and divers. Millions of dollars were saved for their client, says Dive Works, by utilising the Leopard’s size, power, agility and manoeuvrability to its best advantage. “We now have a vessel with a speed of 19kts which can be mobilised and reach a job 400 miles away within 24hrs - and go places big vessels can’t go," said Dive Works’ managing director Andrew Ford. In this contract, the ROV: l Penetrated deep inside a complex platform structure to perform heavy-duty repair work and deploy underwater rigging to locations larger vehicles could not access. l Performed a 490 km long PNG pipeline survey fitted with camera booms and wheeled skid. l Operated a crawler to inspect welds on a number of platforms in extremely shallow water. l Worked a 36,000psi water blaster for cleaning platform legs to bright metal. l Inspected platform risers whilst handling 200kg of sensor equipment. ROV Falcon Feeds on Salmon The largest majority privately owned producer of fresh salmon in Australia, Huon Aquaculture, has ordered a second Saab Seaeye Falcon underwater e-robotic vehicle. Their newest Falcon is now enhanced with Saab Seaeye’s iCON behaviourbased intelligent control architecture. manoeuvrability to operate with precision amongst large and deep nets and in strong crosscurrents. The design also allows a wide range of equipment for many different tasks to be easily added and changed on a system that is simple and easy to operate. The Falcon's global success comes from having packed five powerful thrusters and an intelligent distributed control system in a compact 1 x 0.5 x 0.6 metre versatile system that has been proven worldwide since 2002. MacArtney ROV Winch A prominent defence contractor, who is an existing user of SubConn connectivity products and EMO multiplexers from MacArtney’s product portfolio, has taken delivery of a customised winch solution equipped with a 3000 m fibre cable and termination. The traction-based winch has been purposebuilt for use with a customer-built ROV designed for localising objects lost on the ocean floor. The winch is made from stainless steel and features a modular and compact design, which allows for flexible system installation on board vessels with confined deck space. It comes with several intelligent features facilitating accurate and effective equipment handling as well as a fibre optic slip ring, fibre optic cable, and fibre optic termination. A soft-start function makes the winch easy to handle, improves equipment manoeuvrability, and protects the motor and gear. This specialised winch also features traction control making the winch capable of handling the neutrally buoyant Kevlar reinforced fibre optic ROV communication cable. Commenting on MacArtney competences, the Pakistani defence contractor, states: We recently visited MacArtney headquarters to get an impression of the company. We are very confident with what we saw. No doubt, we continue our business relations for future projects, too. Universal AUV Connection A universal interface to facilitate Autonomous Underwater Vehicle (AUV) docking with subsea structures is being developed through international collaboration between companies and universities in Brazil, Norway, Poland, Sweden and the UK. The consortium, led by WiSub, includes leaders from industry and academia; Bergen University, DOF Subsea, easySubsea, Federal University of Rio de Janeiro, Kongsberg Maritime, Saab Dynamics, Sonardyne, Statoil, Swire Seabed and Warsaw University of Technology. Statoil Norway is driving the initiative in a project whose results shall enable long-term remote operation of underwater vehicles through battery charging and high-bandwidth data transfer via a seabed-based docking station. The ability to charge distributed sensor networks from AUV systems shall also become possible with bi-directional power transfer being developed in the project. This joint industry project is receiving financial support from the Research Council of Norway and Brazil’s R&D funding body, Finep. The project is led in Norway by WiSub and in Brazil by easySubsea, experts in pinless power and data connections and wireless underwater communication respectively. Bouncing Bombs A team of Royal Navy clearance divers from the Faslane-based Northern Diving Group (NDG) have assisted in the recovery of historic World War Two bouncing bombs from the bottom of Loch Striven. In July, three of the famous “Highball” bombs broke the surface of the Argyll Loch for the first time in over 70 years. They were among an estimated 200 of the Barnes Wallis designed munitions tested on the loch ahead of the famous Dam Busters raid in 1943.
the all clear, and then raise them to the surface. Attaching specialist lifting equipment to the heavy metal Highballs, the NDG team then winched them out the water and onto their workboat the Cato. After being secured they were then moved to shore ready for transport in wet tanks containing a special saltwater solution to prevent corrosion. The concept of the bouncing bomb was first described by engineer Sir Barnes Wallis in 1942 and was originally envisioned for use by the Fleet Air Arm. However, in November 1942 the project was split into two strands – codenamed “Highball” and “Upkeep” – with one weapon designed for use against ships and the other, heavier, Upkeep bombs for targeting dams. A recovered Highball bouncing bomb being lowered onto the workboat, the first time it has been on the surface for over 70 years The unique design of the bombs meant they could skip over the surface of the water, avoiding anti-torpedo nets and defences, to hit their targets. Many of the spherical Highball bouncing bombs were tested on Loch Striven, with bombers from RAF Turnberry flying up the loch to bounce their bombs towards old ships which were used as targets. Barnes Wallis produced various prototype bouncing bombs, the dams bomb or Upkeep, the anti-ship bomb the Highball, the Grand Slam which was a 22,000lb earthquake bomb, the Tallboy which was a 12,000lb earthquake bomb, and a 4,000lb earthquake bomb purely for aerodynamic testing. Upkeep was finally used in Operation Chastise the daring RAF Dam Busters raid in 1943. SBSS have announced the successful signing of two contracts – the Hainan OBS Phase 3 project, and the Wando-Jinsan project with Haechun. When specialised cable laying equipment rental company Blue Offshore wanted to upgrade the capacity of its existing equipment, it approached Bosch Rexroth. OBS is a subsea observation cable system in Chinese Waterson which SBSS will conduct cable recovery and re-trenching works. Over the past two years, SBSS has successfully completed phase I and II of OBS, one of China State High-Tech Development Plan projects. "This was a challenging and evenly exciting job," said Remco Buskens, Sales Engineer Specialized Services at Bosch Rexroth. With the industry still in its infancy in China, SBSS supports its growth through technical problem solving and successful delivery. Wando-Jinsan is a 13.2km power cable installation project in Korean waters, with the additional application of 11km cast iron pipe plus 9km ROV trenching for enhanced protection in the strong current conditions at the project site. Both Hainan OBS and the WandoJinsan projects will commence shortly with CS Fu An and CS Fu Hai already undergoing mobilizations for the projects. Insulation Monitoring unit, this complete installation can be defined as a stand-alone unit.” “One way of getting such jobs done is to fully replace all old components with new ones” says Buskens about the extensive service project. “But it is far more cost efficient for our customer, to clean and repair as many hydraulic components as possible. Only those parts that had to be replaced were replaced, others have been brought back in their original state by our service engineers. To do so, we worked closely together with both our experienced team in Zwijndrecht and the technical engineers from Blue Offshore, with whom for example the revised manifolds have been thoroughly discussed.” The increased cable length that is stored in the basket carousel will add up to an astounding 80 kilometers. To handle the bigger forces resulting from this increased size and weight of the basket carousel, the tensioner equipment was modernised and provided with a double set of revised hydraulic cylinders and new Hägglunds hydraulic motors, which are able to generate high torques at low rotations. Bender has launched a new isoHR685W-D-B LIM for subsea cable insulation monitoring system. The ISOMETER iso685 is an insulation monitoring device used worldwide in unearthed IT system [AC, AC/DC and DC power supply applications]. Bender has focused on enhancing capability of iso685 with a new generation of insulation monitoring devices which exactly meet the needs of customers within challenging industry sectors. The latest addition is the isoHR685WD-B , designed specifically for subsea cable monitoring. State-of-the-art in terms of reliability, measuring technique, operability and design, the new generation isoHR685W-D-B Line Insulation Monitor (LIM) delivers a higher level of integrity monitoring. Operators rely heavily on subsea cabling to cost effectively process natural oil and gases extraction from the seabed. Umbilical cables are vital components within the infrastructure, and failures severely impact production revenue. The cost to install, replace and repair subsea cables is significant, and the operation time consuming. isoHR685W-D-B LIM for subsea cable insulation monitoring system Oil and gas operators therefore demand the earliest possible warning of insulation cable failure, enabling them to be more efficient, and effectively minimise repair costs within planned maintenance programmes. The isoHR685W-D-B monitors subsea and umbilical cables to provide earlier advance warning of cable degradation and failure. It is designed specifically to meet the needs of the oil and gas industry sector. It continuously monitors cables up to 10GΩ, delivering a huge performance improvement compared to previous versions, and offering accurate synchronisation of up to 100 isoHR685 to limit cross cable disturbance between long parallel cables. capable assets and project engineering team. The installation will centre on a 96-fibre armoured cable supplied from Hexatronic, installed by the CS Recorder using the proven Hi-Plough to ensure appropriate cable protection in the hard chalk seabed. Due to be completed and operational in 2018, the Rampion Offshore Wind Farm, owned by E.ON, the UK Green Investment Bank plc and Canadian energy company Enbridge, will generate 400MW of power, the equivalent of the electricity used by almost 347,000 homes, comparable to around half the homes in Sussex. offshore installation is envisaged to start in the 2018. Deutsche Bucht will be operational by the end of 2019. The offshore wind farm will consist of 31 8 MW wind turbines and will have a rated power of 252 MW. This is enough to provide more than 178,000 homes annually with sustainable energy. Renewables Tidal Technology Subsea7 and Flumill have signed a letter of intent to collaborate on the development and design of marine tidal technology. Flumill is an Arendal-based company in Norway that has developed a patented concept based on rotating helixes for cost-effective production of electric power from tidal water. The company has completed several successful scale tests of the concept, and the technology has gained considerable international interest. pleased that Flumill and Subsea 7 have signed a letter of intent that sets the framework for a close cooperation”, says Anders Holm, Managing Director of Flumill AS. The power from tidal water will drive the screwdrivers with two opposite rotating helixes. The turbines have lower end generators and they are attached to a foundation on the seabed. The buoyancy system allows the turbines to flow with the tide to an operating angle of between 25 and 60 deg. The first turbine foundations for the Blyth Offshore Demonstrator Wind Farm development have been making their journey up the River Tyne en route to their final destination. The project will see five wind turbines with a total generating capacity of 41.5MW installed around 6.5km off the Blyth coast. Concrete gravity based foundations (GBFs) form part of the project and are being installed using a new ‘float and submerge’ method – the first time this method has been used for offshore wind turbines. Designed and built by Royal BAM Group in the Neptune dry dock on the Tyne, the GBFs are being floated into position at sea and submerged onto the seabed to provide the support structures that act as the foundations for the installation of the wind turbines. Each GBF is made up of more than 1800m3 of concrete and weighs over 15 000t when fully installed on the seabed. The structures have a total height of around 60m from the base to the access platform. The GBFs have been constructed at the Neptune dry dock over the past 12 months by BAM Nuttall and these structures will be floated down the river to the Port of Tyne, where extra ballast will be added ahead of their ‘tow-out’ to the offshore wind farm site. l The GBF has been fitted with a groundbreaking sensor system designed by the Offshore Renewable Energy (ORE) Catapult. This is the first time that sensors have been installed in a gravity-based foundation and used to analyse the performance of the foundations in the challenging conditions they will be exposed to in the real-world. The data collected from the sensors will be synchronised with ORE Catapult’s met mast, located three nautical miles off the Blyth coast. Nexans has won the order to supply a pair of 90km-long high-voltage direct-current cables which will transport up to 900 MW of wind power from North Sea Cluster 3 to the Emden/Ost converter station. The €100 million contract not only comprises the XLPE-insulated 320 kV DC cables, but accessories and installation. In addition, Nexans will be installing a fibre-optic cable for data transfer. The project – Nexans Deutschland’s biggest to date – is scheduled for completion in 2023. The geographical location of the offshore wind farm to be connected means that the offshore grid connections run via the ecologically sensitive Wadden Sea. This is also the case with the DolWin6. On the way from the DolWin Kappa converter station, where the three-phase current generated at sea is converted to direct current, to Hilgenriedersiel on the mainland, around 45 km away, the cables will cross the island of Norderney. To help protect the Wadden Sea and the flora and fauna on Norderney, horizontal drilling will enable the cables to pass under the island. TenneT is beginning work on this part of the project this year, as in order for the dykes and natural features to be protected, it can be carried out only between midJuly and the end of September Nexans will also install the cables carefully and within suitable time frames. The submarine cables, manufactured in Norway, are scheduled for delivery and installation in summer 2020 and 2021. Installation of the land cables, produced in Belgium, between Hilgenriedersiel and Emden – a distance of roughly 45km – is planned to take place from 2020 as well. VBMS has been awarded a contract to assist DEME’s subsidiary Tideway with the installation of three nearshore and shallow water sections of export cables for DONG Energy’s Hornsea Project One Offshore Wind Farm (OWF). The scope of work for VBMS consists of the shore landing, installation and burial of three 33km long sections of export cable which are part of total cable lengths of approximately 134km, 140km and 152km to be installed by Tideway. The project will be executed in Q1 and Q2 of 2018. GW in capacity as well as the world's largest offshore wind farm. l VBMS and High Voltage engineering specialists EDS will launch a new forum to introduce their Cable Integrity Solutions. According to VBMS, there have been more subsea cable faults than anyone could have predicted. It says the industry needs to come together, get the issues out into the open and come up with short and long term solutions. VBMS and EDS estimate that their solutions mean that cable repairs could be completed up to 70% faster. The successful applicant for project 1 should have a first‐class honours in Civil Engineering and experience or interest in offshore geotechnical engineering. Project 2 applicants should have a background in coastal engineering, oceanography or a related field. An annual tax-free scholarship stipend of AU$35,500 will be provided to the successful students, as well as covering tuition fees (if applicable). Successful candidates are encouraged to also apply for the Research Training Program (RTP) Scholarships. Osbit has delivered a hybrid monopile cleaning tool to Van Oord. The Hybrid Marine Growth Cleaning Tool is currently supporting a project at the Walney 3 & 4 offshore wind farm in the Irish Sea, where Van Oord is charged with installing 87 monopiles for DONG Energy. The tool offers combined monopile cleaning, anode cage lifting and installation down to 30m water depth, along with monopile survey and measurement capabilities, supporting Van Oord’s commitment to improving the efficiency of pile installation operations. To ensure the monopiles are sufficiently prepared for grouting and the installation of the transition pieces, Osbit’s tool utilises a suite of 10 rotating cleaning headsto prepare the monopile surface to fit the transition piece. The system’s cleaning heads are adaptable, to enable effective cleaning of the tapered monopiles, which have an increasing diameter of six to eight metres. Previously, each of these tasks would require the use of individual systems, which would increase the duration and complexity of the installation programme. Research Sonardyne on Research Vessel Ocean science technology company, Sonardyne International announced that it has been awarded the contract to supply Britain’s new polar research vessel, RRS Sir David Attenborough, with subsea acoustic tracking and position reference equipment. The Ranger 2 Ultra-Short BaseLine (USBL) system will be used by scientists to precisely track the position of, and communicate with, scientific instruments and robotic vehicles deployed from the vessel, including the Boaty McBoatface AUV. Ranger 2 will also be interfaced with the vessel’s dynamic positioning (DP) system for precise station keeping during science operations. Commissioned by British Antarctic Survey, an institute of the Natural Environment Research Council (NERC), and being built by Cammell Laird in Birkenhead to a Rolls Royce design, the RRS David Attenborough will be one of the most advanced vessels of its type when it enters service in 2019. Measuring 128 metres long and 24 metres wide, the new ship will have a range of 19,000 nautical miles and be able to accommodate up to 60 scientists engaged in ocean, seafloor and atmospheric research. Sonardyne’s Ranger 2 will support the RRS Sir David Attenborough’s pioneering work by enabling science teams to precisely monitor the position of underwater systems deployed from the vessel. Sonardyne’s exclusive wideband acoustic signal technology and 6G (sixth generation) hardware platform allows autonomous and remotely-operated vehicles, towed platforms and seafloor landers to be simultaneously and precisely tracked to ranges beyond seven kilometres. Alongside design and engineering services, Rolls Royce is supplying a comprehensive package of control systems and equipment for the vessel, including the DP system. This will utilise data from Ranger 2 to maintain a stable vessel position as equipment and vehicles are deployed and recovered in some of the most challenging marine environments on the planet. Sonardyne’s contract includes the supply of two through-hull deployment machines, seafloor and vehicle-mounted tracking transponders, and topside control hardware and software. The first equipment deliveries to Cammell Laird for integration into the vessel have already begun. K-Mate K-MATE is an autonomous surface vehicle control system from KONGSBERG. It is designed to follow mission plans in addition to providing global supervised operations or even direct operator control for complex tasks. This is now set to be integrated with SEA-KIT, a new class of Maritime Autonomous Surface Vessel being built by UK manufacturer, Hushcraft, and operated by SEA-KIT International. The K-MATE autonomy controller can be integrated with almost any vessel or ship. It provides adaptive waypoint following for survey and AUV operations while accepting sensor data for scene analysis and collision avoidance. SEA-KIT is a USV that can carry a deployable and retrievable payload of up to 2.5t. It is based on the AUV-USV concept, which could lead to more efficient, safer and cost-effective seafloor mapping operations, as well as providing a platform for numerous applications in a wide range of maritime sectors. The SEA-KIT vessel provides a next generation, long-range, longendurance ocean capability that does not exist today. It is able to operate without assistance for months at a time and is the first of a new generation of craft that can truly operate independently. "K-MATE is capable of being integrated with almost any vessel via an electrical interface," said a spokesman. "It provides adaptive waypoint following for survey and AUV operations while accepting sensor data for scene analysis and collision avoidance." K-MATE has been developed by the Kongsberg Maritime Subsea Division in Horten, Norway in conjunction with FFI, the Norwegian Defence Research Establishment and is the result of a long and fruitful history of joint development projects, including the HUGIN AUV System. It will be managed by the GEBCONF Alumni Team, led by alumni of The Nippon Foundation/General Bathymetric Chart of the Oceans (GEBCO) Postgraduate Certificate in Ocean Bathymetric Training Programme, run at the Centre for Coastal and Ocean Mapping at the University of New Hampshire, USA â&#x20AC;&#x201C; now in its thirteenth year. The Nippon Foundation, Japan's largest private philanthropic foundation with a long history of involvement in maritime issues, has agreed to provide more than US $3 million to assist with concept development and the design of new technology to be utilised in the semifinal stage of the competition by the GEBCO-NF Alumni Team. All alumni hold positions in their own countries' maritime industries. GEBCO is the only organisation with a mandate to map the entirety of the world's ocean floors. The Chairman of The Nippon Foundation, Mr Yohei Sasakawa, recently launched NF-GEBCO Seabed 2030 â&#x20AC;&#x201C; with the challenge to map the world's ocean floors by the year 2030. MBES for Canadian Coastguard The Canadian Coast Guard has chosen Kongsberg Maritime to provide high resolution EM 712 multibeam echo sounders to the Canadian Coast Guard's medium icebreakers, CCGS Pierre Raddison and the CCGS Des Groseilliers. Gathering critical hydrographic data can be a challenge in the Canadian Arctic. The innovative, retractable design of the new EM 712 echo sounder systems optimises performance of the sounder when deployed and protects it when the vessel is breaking ice. When deployed, the high-resolution EM 712 collects navigational and scientific data from otherwise inaccessible parts of the planet and is capable of mapping a swath of the seabed up to 3000m wide in 3600m of water. The CCGS Louis S Laurent and the CCGS Amundsen are each equipped with larger, ice protected, deepwater sounders from Kongsberg. The light icebreaker CCGS Sir Wilfrid Laurier is equipped with a retractable Kongsberg EM 2040C shallow-water multibeam echo sounder. the EM302. SEA-KIT also has extended endurance options, making it the first autonomous boat capable of transocean survey operations. SEA-KIT is due to be launched this September. Its first task is to compete in the $7 million Dollar Shell Ocean Discovery XPRIZE, a global competition with the aim of advancing deep-sea technologies for autonomous, fast and high-resolution ocean exploration. Sea Quest This semisub discovered the first North Sea oil on Arbroath. A year later, in 1970, she discovered BP's Forties. She was built in 1966 by BP at the Harland and Wolf yard in Belfast. The design was based on 3 columns, 11m in diameter. She was sold to Sedco in 1977, but in 1980, was damaged in a blow out in Nigeria. Following this, she was sunk in deep water JI I was on the next generation [four columns] BP rig Sea Conquest when we experienced a blow out during BP Magnus subsea well completions. Only two lifeboats, one fore and one aft - the aft one was covered in oil, there was a strong head wind so the forward one could not be launched and the helideck had a high gas alarm so no chopper could land - happy not to experience that again! The Sea Conquest was then sold and became the Ocean Ben Loyal and that was the end of the two cans a day although you could still hear the occasional crack and hiss of a can opening in the cinema room for a few months! CJ That's when you could get the job done without HSE interference ,great days with great people DB I believe she went to Sedco and became the Sedco 135 Charlie. I was on the Sedneth 1 offshore Nigeria at the same time, the 135 had had a blow out and was spewing gas, liquids and debris high into the air. We were in the process of drilling a relief well. One night we were all mustered to the Sedneth helideck to see the 135 engulfed by fire, even about a mile away the heat could still be felt. ....... by the light of day the rig was a total loss and was later towed from site and sunk in deep water.... I always carried a camera with me in those days but on this hitch had used up all my film !!! Gannet Shell's Gannet development consists of subsea developments tied back to the main Gannet A fixerd platform. The Gannet B system is connected by a pair of 6in gas pipelines but bringing in the much larger GannetC system, with its 4 drill centres and larger number of wells, was more challenging. B Strange to see the good old Apache in grey. Was always red when I saw her in the CSO days. MG John Meenahan was also a great guy to work with. I was a Client Rep onboard during several projects with both Bobby Beaver and John RT I hv served on this vessel ☺️ scraped in 2010 SB Fond memories of several years on board as Hydraulics Engineer during the second half of the 90's. Hard to keep up with a utilisation rate of around 97% at the time until we lost a steady seasonal contract with Petrobras due to a last minute decision to divert her instead to a short job in the Tasmanian Sea. She saw many lay ups after that point as DSND's Navica picked up the work in Brazil. Great ship and crew. I still miss the camaraderie amongst the crew. Learned so much from Bob and Pepe. JG Miss spent my youth on that boat. Had so many great friends. Also worked for a wonderful gentleman named Bob Beavers. got entangled in the North Sea. It was retrieved after 8 hrs. My friend was in it. He panicked. After he surfaced and went to shore he quit the offshore industry!!! to pee into! Happy days!! Have also dived with the LR5 off Arran before developing a basic Virtual Reality demo of the cockpit during a rescue mission of a Russian DISSUB. ID I have been to the bottom of Loch Linnhe near Fort William on LR5 (if I recall the number correctly) back probably in 1978-79 when I was a student at Strathclyde U & she was understanding sea trials. Drillmaster Buchan was discovered in August 1974. It was geologically challenging and BP's engineers were tasked with minimising costs in order to bring the field onstream economically. The project envisaged converting the 5-leg semisubmersible rig Drillmaster, to a production platform. This was more costly than first envisaged, especially is it neded retrospective upgrades following the collapse of a similar rig, Alexander L. Keilland, which killed 100 people. Production of the Buchan Oil field came on-line in May 1981 In August 1996 the fiels was sold to Talisman . Chaired by: TBC ETM programme is subject to change Latest Innovations in Pipeline Construction and Integrity Management Mathieu Beaujon, Regional Commercial Manager APAC, SERIMAX Last years have seen significant efforts put into new technologies and innovations to optimize costly offshore operations on pipelay vessels. The “firing line” has been scrutinized by the industry to find ways to improve productivity without compromising the integrity and quality of CRA pipelines. Critical path activities such as the fit up of two CRA pipes together is a key area of improvement. Because Linepipe end matching is now mandatory for almost all CRA pipeline projects , laser technology called cleverscan is now used for pipe end laser dimensioning and sorting . By optimizing fit up time and fit up quality, vessel production and pipeline integrity are improved. Serimax also developed a full range of technologies to enhance pipeline integrity such as the “Roxane” gas purging and monitoring system or “Scanvision” tool all integrated onto the ILUC (Internal Line Up Clamp), or “Cleverweld”, a fully automated integrity management solution designed for customizable, fit-for-purpose pipeline production reporting, full traceability for welding, NDT, field joint coating, and data storage from anywhere in the world. The presentation will detail how Serimax think and developed all their latest innovations, their benefits and how they fit in the big picture of a pipeline project, from linepipe manufacture to final offshore installation. A demonstration of the Cleverscan tool will also take place during the ETM. Pre-Qualification Testing of Styrenic-based Wet Insulation System and Castable Field Joint for Offshore Pipelines Marcos Mockel, Senior Manager, Global Technical Solutions, Pipeline Performance, Shawcor The presentation outlines Thermotite® ULTRA™, a styrenic-alloy insulation system and NEMO 1.1 field joint coating. ULTRA™ provides a lower thermal conductivity and higher strength than conventional blown polypropylene foam systems. Consequently, it provides a thinner solution and suitable for greater water depths. NEMO 1.1 is an epoxy-urethane hybrid system that is suitable as field joint coating system and achieves a high level of bonding to the adjacent styrenic, olefinic and urethane based wet insulation systems. NEMO 1.1 material overcomes the challenges associated with traditional polyurethane (PU) systems and at the same time allows for cycle times similar to PU systems. A pre-qualification test has been carried out using Thermotite® ULTRA™ and NEMO 1.1. The results are shared, including full scale simulated service test, bending and roller box test. Application of Composite Technology in Deepwater Benoit Lamoureux, Director, DORIS Engineering Australia Pty Ltd Thermoplastic composite pipe (TCP) is considered as a promising technology to enable cost effective field development. This presentation will review the current state of the art for TCP application, the technical limits, the selection criteria and the benefit expected for subsea deepwater and ultra-deepwater environments. Comparison between the use of TCP solution and equivalent steel pipe’s technology will be provided for typical of field developments. Offshore and Subsea Electrical Technologies as Economic Enablers Peter Baker, Senior Subsea Engineer, SPEC Consultancy New offshore oil and gas developments have to compete even harder for economic viability at current global oil and gas prices. However, offshore technologies have been developed enabling marginal or even currently unviable developments to become more competitive. A number of electrical technologies are now available for use as long as the correct qualification steps are taken to manage the risk of their introduction. Typical technologies include: Active flowline heating (Direct Electrical Heating, Electrical Trace Heating); All electric subsea production systems; Long distance offshore power transmission and distribution; Gas to wire. In the right applications, using one or more of these technologies can change the economics of marginal offshore developments, allowing lower cost developments to go forward in this more competitive environment. Student/Individual/Corp Members $30*: Non-Members $50: (additional $5 if paying on night) 5 Ticket Member Pass: $125, 5 Ticket Non-Member Pass: $225 Join the Society for Underwater Technology Now *New Individual Members can attend this Evening Meeting Free* Apply for Membership today by visiting www.sut.org.au. SUT Evening Technical Meeting registrations are online. Payment during the registration process (via credit card or invoice) is required in order to secure your place. 5 Ticket Passes are for consecutive meetings. They can be transferred to a fellow Member or Non-Member if you cannot attend. Should you have any questions please contact the SUT on + 61 (0) 8 9446 9903 or email perthevents@sut.org. ... permanently installed PC 1802 submersible. It had a maximum diving depth of 300m. The fourman submersible was supplied and operated by Intersub. It had a lock out capability for two divers. LP The STPM Norlift , before stretch and tower. FC Before that she was the NOS Nolift JA Did she come to Shell? Miri as Pacific Installer ? Around late 80's ? CN I worked on her at Norther Ocean Services when she was the converted to the Norlift. She was blue then though! DT Last known as the Kestrel at Stolt before sold to CalDive in the GoM before they went Chapter 11 and subsequently belly up. Would roll on wet grass! CN Rolled like a pig and as slow as a wet week IG Think I've seen her in yellow long time ago, early 2000's when Stolt was in the ropes CB Loudest bow-thruster cabin I have ever 'slept' in PA One of the best sat boats around. She was reliable and fun to work on. Does anyone remember when it fun to work on a happy boat. She was and always will be the KESTRAL. Anyone who was on here when we came back aberdeen and we nearly rolled over in storms off aberdeen will know how the old girl looked after her own. Brilliant workhorse. The first of three of Brent A's 3000t jacket frame sections being rolled up to vertical at the Redpath Dorman Long yard in Methil. This was the largest structure lifted by any fabricator. At the centre are the two 110m trestle towers that carried the two pairs of lifting cables. The Hoton and Hyde gas fields have been developed using the not normally manned satellite platforms. More recently, the seven seas gas field was tied back to West Sole.Perenco acquired the fields from BP in 2012. Ekofisk is the oldest field complex in operation on the Norwegian continental shelf. The operator is ConocoPhillips. In June 1973 an oil storage tank was installed successfully in the Ekofisk field in the North Sea. In Nov 1973 the structure was subjected to several storms that resulted in loads close to the 100-year design values. Designed by the French company C. G. Doris, the Ekofisk tank is shaped like a square with rounded corners and covers an area of 7,360 sq m (79,200 sq ft). The Graythorp jacket that went to Forties. At the time, it was one of, if not THE heaviest jackets in the world. Built by Laing on Teesside BR Think my Dad worked on this didn't he Craig Rose? Chris Orthodoxou this is even before your time!! !đ&#x;&#x2DC;&#x201A; MW I worked on the hook-up of the last jacket Thistle Field (stillI worked on the hook-up of the last jacket Thistle Field (still in production) that left Laings Graythorp yard in 1976 II How times have changed They used to build in graythorope yard now we pulling rigs to bits there JB Served my time at the yard, ive still got my jacket and it still fits. AR Remember it well worked on the floatations tanks at Brown & Root PW Worked on it at Whessoe number two shop, at Greythorpes for Laings and in the North Sea for Press and Whorley. KK Passed it every day working at Fost Wheelers, then Foster Wheeler John Brown Boilers, Foster Wheeler RR&A.The Old Graythorpe has changed a lot now. AR This was my first job. I was a dimensional controller on this project. Use to check the water pressure readings under the dock gates and also reported the first instance of the flotation tanks lifting of there supports when the dock was flooded. Pity that mostly everything now for the UK sector is built abroad. Even in the renewable arena it mostly comes from Denmark, Sewden , Germany , Holland and we worry about trade deals post Brexit. They already have trade deals - one way all into the UK.) . Last June, it was announced that Britain’s largest storage site for natural gas is to close permanently. British Gas has concluded that its 32-year-old Rough storage facility off the Yorkshire coast could no longer be operated safely Gas can be injected into its permeable sandstone reservoir at times of surplus supplies and drawn from when needed. This accounts for 70 per cent of UK gas storage capacity. It can meet a tenth of the country’s daily peak gas demand in winter. JW Was there in 78 when a character called George operated a "Travelling Picture Show" . Needless to say, the filme weren't the latest blockbusters but more of an adult nature! Free hard hat stickers were given to attendees stating "Ive been to the George ***** travelling picture show". Was a bit like the wild west offshore back then. KP Just checked old notes. Ocean Technical Services bought it in Lieth in about '85. It was sat on the bottom with the stern almost awash. I was tasked with turning it into an ROV vessel. Many tears and long days later it went out for BY Marine on a 65 day job and came back with zero fowntime. I wish I could remember the name of the OTS manager who was terrific. (He drove a big green Jag)…see more TS Great nostalgic picture, it looks like there is a jack up drilling rig on 3B at the CD jacket. Today we have a jackup at BD jacket with lots of activity ongoing, the Rough field is still very much in business after all that time! The 4-leg jack up Britannia skidding the derrick over to drill through the wellhead platform DB Dived on it !! KP There's a couple or three of those rigs in the Gulf of Suez, Mercury, Comet and the Ocean Tide, now called Ben Nevis. Good solid rigs IT GSP in Romania has it I think ? 111 The PULSE CIMV’s nonintrusive, line-of-sight ultrasonic flowmeter achieves accuracy better than ± 3% of the reading.